This meditation bundle has three powerful meditations that incorporate guided visualisations with NLP techniques, binaural sound, and more, to give you a uniquely personal, deeply transformational, meditative experience. 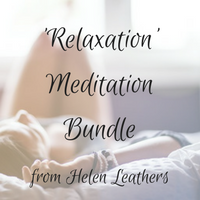 Experience Deep Relaxation For Body, Mind, And Soul With The ‘Relaxation’ Bundle. Crystal Clarity: For those times when you can’t stop your brain from working over-time, you’re going round in circles with your thoughts or you simply have way too much to do or think about. De-stress: Whether it’s physical tension, mental stress, or emotional angst this track will help you unwind and let go on all levels. Your bundle includes 3 MP3s and a quick guide to using my meditations. Have a read of the guide, it is designed to help you get the most out of them. A lot of study, preparation, work technical knowledge, emotions and effort as well as expense as gone in to creating these meditations for you. So please enjoy them, and tell people about them, but do not share them. P.s. If you’re not very technical, it’s easy to unzip a file. Simply double click on it once downloaded, and all your files will appear as if by magic.